Of course I would never do such a thing! I am, however, teaching a Mock Caldecott course here at Dominican GSLIS this fall. How fun is THAT? A Mock Caldecott? For graduate credit (PS. It’s open to auditors and students-at-large, so join us even if you aren’t a current student)? Since we’re doing this in the fall semester, voting the weekend of December 12-13, I’m particularly excited to see how our choices stack up against the “real” winners, to be announced during the American Library Association’s Midwinter Meeting in Boston at the Youth Media Awards press conference, January 11, 2016. I’m in the thick of preparing the course now, and true to the “real” process conducted by the Association for Library Service to Children (ALSC), I’m seeking suggestions from our “membership” (that is, readers of this blog, not necessarily ALSC members, although I hope you’ll join if you aren’t already a member). Which 2015 picture books have resonated with you and/or the children you serve? I’ll use this suggestion list to get my students started; also true to the real process, they will have the opportunity to make suggestions, write nominations, and–of course, the most fun part–deliberate and vote. Interested in learning more about the Caldecott Medal, its history, eligibility terms and criteria, and more? Visit ALSC’s Caldecott Medal web page. Please, please, help me with some good suggestions! Otherwise, I’m left to my own devices, and combing what’s been starred so far by the various journals (noticing weird and meaningless things like the fact that “The Octopuppy” by Martin McKenna and “The Octopus Scientists” by Sy Montgomery and Keith Ellenbogen have both received stars this year). The Caldecott terms and criteria constitute a particular, prescriptive lens through which to look at picture book illustration. 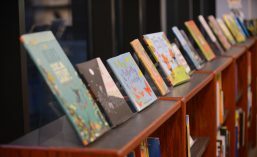 The Caldecott Medal is arguably the most prestigious prize a picture book can win, and as such the specific elements and attributes it recognizes have a particular role to play as we examine and evaluate books in the canon. To be sure, the Caldecott terms and criteria are not the only measure we can apply. Indeed, in our day to day work with children, other things–iconic characterization, accessibility, suitability for a group read aloud–can be much more significant. Still, measuring picture books with the Caldecott measuring stick allows us to delve deeply into the quality of the illustration, and gives us meaningful information about the application and legacy of the Medal itself.